Whether you have a peanut allergy in your family or are simply looking to shake up mealtimes, try some of our favorite recipes that let almond butter star as the lead ingredient. If you’re already a fan of peanut butter, it’s likely that you’ll also enjoy its relative, almond butter. Almond butter, one of the many nut butter alternatives to peanut, is packed with protein, vitamin E and monounsaturated fats—the kind of fats that promote heart health. 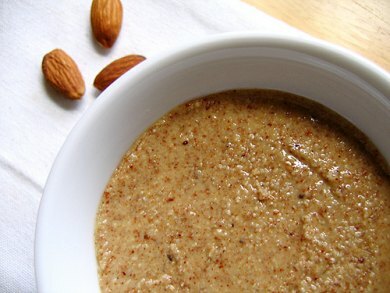 Whether you have a peanut allergy in your family or are simply looking to shake up mealtimes, try some of our favorite recipes that let almond butter star as the lead ingredient. A healthy alternative to sugar-laden cereals, this nutritious spin on a breakfast burrito is easy to assemble and even easier to eat. Creamy and delicious almond butter with fresh fruit rolled into a whole wheat tortilla is a great way to start any morning. Warm the tortillas in the microwave oven; spread a tablespoon of almond butter on each tortilla. Divide peaches and pears between tortillas and sprinkle each with cinnamon; drizzle with honey; wrap like a burrito and warm over a hot skillet until lightly browned. Making your own granola bars is simple, fun, and economical. The best part is that you can tweak and customize your favorite recipes to meet your own standards, needs, and tastes. Mix together the protein powder, flour, oats, oat bran, cinnamon, and salt in a large bowl; crumble in the brown sugar, rubbing it with your fingers to break up any clumps; stir in the chocolate chips. Measure yogurt, oil, and vanilla into a second bowl, stirring until well combined; add the wet mixture to the dry, and mix patiently until thoroughly blended. (You may have to use your hands—it will be a thick batter, almost like dough). Transfer the mixture to the prepared pan, patting it evenly into place with your hands; bake in the center of the oven for 15 minutes, then remove from the oven and cut into bars of any size or shape; place the bars on the prepared baking tray and bake for another 15 minutes, or until golden around the edges. (For extra-crunchy bars, turn off the oven and leave them in for up to 45 minutes.) Remove the bars from the oven, and place them on a rack to cool. Eat the bars within a few hours, or seal them in a heavy zip-style plastic bag and store in the freezer. For maximum crispness, "refresh" them in a toaster oven after defrosting. The holiday season might be ending, but cookie season has only just begun. Whether you’re baking with your kids on a rainy afternoon, or churning out batches in the morning as surprise lunchtime snacks, toasted almond pieces and the crunch of toffee in a shortbread-like cookie will never fail to bring a smile to a person’s face. Preheat oven to 350 degrees F. Using an electric mixer in a large bowl, blend together the sugars, butter, and oil until well combined. Add almond extract and eggs and mix well; blend in the flour, baking soda, salt, and cream of tartar; stir in the almonds and toffee bits, mixing well to distribute. Cover and chill the dough for 1 hour. Scoop dough into large tablespoon sized balls and roll in sugar. Place 5-inches apart on ungreased cookie sheets. Press dough with the bottom of a glass dipped in additional sugar; bake for 14 to 19 minutes, or until light golden brown around the edges. Cool 1 minute, then remove from cookie sheets to wire racks to cool completely. Winter days are short and evenings are even shorter, especially when you’re trying to get dinner on the table for your busy family. What you need, instead of take-out, is a light and tasty chicken dish that's quick and easy to make. 1, 6-ounce package fresh grilled chicken breast strips. Meanwhile, stir together almond butter and sesame dressing in a small bowl. Cut cooked chicken into bite-sized pieces; thread chicken and broccoli, alternating, onto 6 skewers. To serve, divide sauce among 2 small bowls, or ramekins, and place them on two small plates. Divide skewers among plates and serve. Tip: By multiplying the quantity of almond butter and sesame dressing, you can have a dipping sauce to use all week for vegetables, chicken, shrimp, and more.